Today we are talking to Cammy Murray. Cammy is a Social Media Marketer who creates daily Snapchat stories. 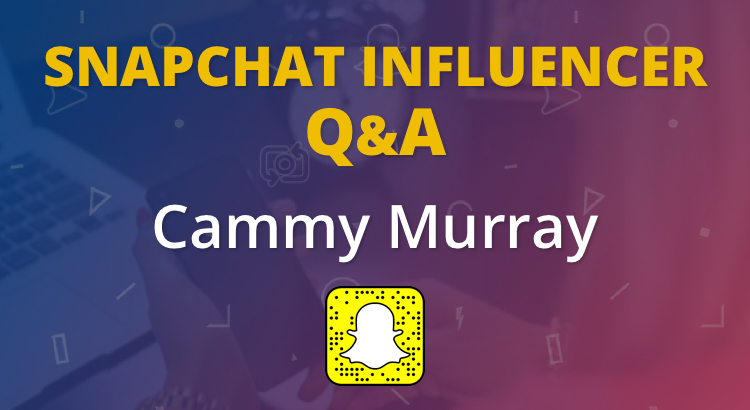 In the interview, Cammy talks about why Snapchat is the best platform for storytelling and how you can utilise it to grow your personal brand or business. He also recommends some Snappchatters who you can learn from. I recommend following him too by scanning the snapcode below! Hi Cammy, great to meet you. Thanks for taking the time to share your knowledge with us. Could you tell us a bit about yourself and what you do? Jason, huge (huge!) thanks for getting in touch, truly humbled, and looking forward to seeing what insight I can bring. I’ve been involved in Marketing for a good few years now, and currently work for a Glasgow based Brand Agency, Stand, where I perform the role of Social Media Specialist, a job title I painstakingly campaigned for, to avoid the many cliché titles in use out there, surrounding social media. I’m a self-taught Social Media Marketer. And the key to being a damn good practitioner on social is simple – getting your hands dirty with it! Working for an agency has been fantastic for me. Previously, I’d been involved with individual brands; marketing manager for a brewery was fun. However, through the many, and varying, brands I’ve been fortunate enough to be involved with, I seized the opportunity to expand my understanding of branding in areas I was less familiar with, something which, in hindsight, has played a huge role in my development. As for my favouring of all things social, as opposed more traditional forms of marketing, well, that’s simple… It’s 2017, and in 2017, I feel there is no better way of telling your brand story, and communicating with brand advocates, than through the many many social platforms out there. Snapchat is the perfect platform for storytelling. How can brands utilize this? For me, Snapchat is thee platform for storytelling. To explain this further, I feel it’s best to explain what a brand actually is first, something, which many people have failed to grasp – it still baffles me to this day that the term ‘brand’ continues to be misunderstood. Branding is not about the product, it’s about the meaning behind it, yes it can be considered a mark of quality assurance, but your brand is the ‘why’ you do what you do – that’s your brand story. And when it comes to your brand story, it ain’t about how good you are, it’s how well you tell that story. Snapchat, by design, encourages its users to share their experiences in the moment. Through the purposely set limitation of posts being shared in short clips or pictures, their unique ‘social language’, they are practically forcing people to consider how they will get their message across – how they can get it across in Snapchat’s native tongue – often leading to the consideration of messaging being constructed with a beginning, middle and end… or, a story, if you will. Too many brands fail to consider their audience, and given the stage to put their message across, they often fall victim to self-promotion, as opposed to offering value to their consumers. Unless these two small (vital) questions can be answered, I often feel that the content in question should be returned to the drawing board for further consideration. The trick to producing valuable content lies in providing ‘access’ and ‘effort’. Provide access to your expertise; whether it be informative, educational, or even just funny, and put the effort into your execution. Access, plus effort, very rarely goes unappreciated. 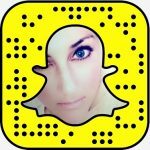 What advice would you give to a small business who is just starting to use Snapchat? Small business and Snapchat… a match made in heaven, right? Snapchat, undoubtedly, offers a huge opportunity to small businesses, where larger companies/brands can often be slow and cumbersome to react, with many decision makers often having to give the go ahead in communicating their brand messaging, small business has the benefit of being more nimble, and quick to react in getting time conscious/reactionary messaging across to its audience. But, it’s not quite as simple as that, though. Snapchat, as much as I am literally head-over-heels in love with the platform, can and does, require a ton of time and commitment to produce content of real value. 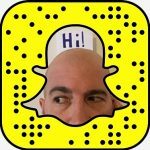 In order for a small business to really maximise its return from Snapchat, they must have a clear strategy, realistic and achievable KPIs, and, above all else, a real sense of what they are trying to achieve through being present on that particular platform, as opposed to any other social media outlet. I’ve been to many a conference, many a client meeting, and involved in many many social conversations, with people desperate to attach themselves to Snapchat, believing that the brand equity gained through their activity on the platform will produce the results they desire. What they fail to consider is that through poor execution, and production of half-assed content on Snapchat, the result can, in fact, be quite the opposite. Too many out there see the medium as the message. Snapchat can be fantastic at offering insights to what your brand story is, why you do what you do, and the culture that has been built behind the scenes of your brand, it’s about people – not the product. On the flip side, it can also expose any number of shortcomings. My advice to small business would be this, to fully consider why Snapchat is the platform for you, and will the time required to produce valuable content provide the desired results. I often suggest to brands, both personal and consumer brands alike, to consider dipping a toe in the water before jumping in with both feet. Without trying to come across as scripted, geofilters are, for me, the perfect approach to brand considering a presence on Snapchat, I mean, it is a simple, cost-efficient approach to promoting your brand on the platform – they allow your brand to be part of other people’s conversations, to be part of their story. Snapchat has released so many creative tools to aide in people’s ability to tell their story, but in my opinion, none can match the effectiveness a well-tailored geofilter can have in adding context to a story. Just think of the content you consume on Snapchat, and the effect that the JFK airport geofilter, or the Brooklyn geofilter adds to the content. It provides a quick and easy reference to exactly where your favourite snapper currently is, and the added context it provides. The real trick is for brands to create geofilters that are complementary to storytelling, and avoid disruptive, self-promotional executions. Think of the traditional fairground, stand in photo props, you know, the one’s with the faces cut out. They worked on a similar level to that of well-executed geofilters, they add to the story, they don’t dictate it, so please, avoid self-promotional geofilters, the vast majority of your audience, and potential audience, just don’t care. If this is considered too heavy a workload, then they can forget Snapchat. If you are looking for a fantastic example of someone doing this right on Snapchat, I hugely recommend checking out @mrmldillman. 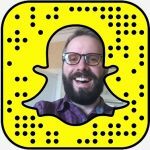 I’ve been catching his snaps for the past 8 months or so, and he is a great example of showcasing a brand in the language of Snapchat. He builds furniture, which in my opinion are more like works of art. His execution builds such interest, really engrossing, I mean, I watched this guy build this stunning wooden table over the space of a week, and I have no interest in carpentry! Remember, great content is created through providing access and putting in the effort. 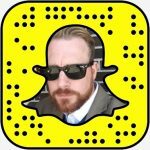 Snapchat has had a huge affect in gaining exposure and development in both myself, and my personal brand. I have very much been an advocate of the role Authenticity plays in ‘good social’, and this is where Snapchat really caught my attention, with the platform practically tailor-made for this approach to content creation. We all know ‘Authentic’ when we see it. There’s no magic formula for measuring someone’s level of authenticity. But, it does exist – you can feel it! Being authentic with your audience, for me, in a 2017 marketplace, is essential in building any brand, not just that of the personal variety. You need to consider the fact that consumers of your content can smell BS a mile off, with inconsistency often being considered and recognised as a lack of Authenticity. And this is where Snapchat and I really hit it off. Through being myself, sharing my honest opinions, often controversial analogies, and the occasional use of expletives, Snapchat not only provided a platform for people to see more than what I was just saying, it allowed people to see the personality behind the words, and gained insight of the where and why of my personal brand… and that when a Glaswegian uses the odd profanity, it doesn’t always mean they’re angry. My authentic approach to Snapchat spilled over to my other social accounts, which had the effect of re-aligning them, and allowing them to be used in their desired way, for example, Twitter very quickly became less of to do with promoting content, and became the platform for communicating, and engaging with people in and around that content. 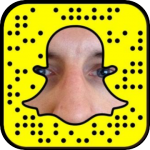 So, what effect has Snapchat had on my personal brand…? Not only has it worked as a pair of spectacles (see what I did there?) that aided in focusing the purpose of my other social platforms, but, it both encouraged and validated my belief that success can be found, complemented with quality content, through simply being yourself. What I must mention, is the amount of value to be gained through the relationships formed on Snapchat. What I’m getting at here, is that there is a wealth of expertise out there, with many people more than willing to share their knowledge with you, a huge opportunity for development, and one which I continue to benefit from. Who is your favourite person to follow on Snapchat? Of all the questions you could have asked, this is the one I feel is impossible for me to answer, impossible to narrow it down to just one. I mean, literally every other week I have the luxury of connecting with new, interesting people, resulting in my “favourite list” forever exponentially growing. However, there are a few Snapchatters out there I have been lucky enough to have built good, solid relationships over the past year or so. These 4 people not only post great stories on a daily basis; and yes actual stories, as opposed to occasional mutterings, but over the past year have built and developed a long-form underlying story, the story of their journeys in their various fields. I’m lucky enough to consider these guys friends, and it’s an absolute pleasure to share them with you. Jason is one of the first Snappers I found who was a natural for the platform. Entrepreneur and community builder, Jason owns a Real Estate Development firm, and Entertainment company to mention but a few. He provides daily insight into the advertising and marketing demands any successful entrepreneur must excel at – and he does! I’m convinced that Lana and myself must’ve been married in a previous life, considering how quickly our relationship developed. Her level of smarts and humour resonate with me every time I tap on that on that little circle, with the blonde bombshell’s content being part of my daily Snapchat routine… Storyteller extraordinaire! Where do I start with Chris, Movie Maker, Creative Director, Social Media Specialist, App Developer, (Creator of ‘Skepticals’) and one helluva guy. I speak to Chris on a daily basis, again, as with all of these guys, an absolute natural on the platform. Whether he’s reinterpreting the subway ads, or giving his own prerogative on social trends, his stories are not to be missed! My first IRL encounter with a fellow Snapchatter. Originally hailing from ‘merica, I have the privilege of meeting up with this newly ‘adopted Scot’ on a regular basis, not to mention catching his stories on a daily basis. He too, is a social media specialist, and someone whose opinion I consider hugely valuable! He constantly provides insight, and has a fantastic knack for interpreting analytics… and if that ain’t enough, I occasionally pop up in his snaps… a ‘Cammy-o’ if you will!? What do you think of Facebook’s recent ‘copycat’ features, and how will it affect Snapchat? Snapchat brought us a new social language, moving away from the news feed found on just about every other platform, and allowing us to catch up with the content we deem attention-worthy and relevant, not the content a platform’s algorithm assumes will be of interest. Facebook’s been slow to adapt to the way people share content today, having just begun to provide overlaid drawing and writing tools, as well as providing filters for Facebook Live, whereas Snapchat has always promoted and encouraged creativity in its users through the provision of it’s, ever increasing, creative tools. It doesn’t take a Mark Zuckerberg to realise that Facebook had to evolve to meet this change in social trends. As for the success of Facebook’s recent update, and thus, the effect it’ll have on Snapchat, is, in my opinion, debatable. Facebook appear to be on a mission to provide a platform that offers everything, the classic news feed, live streaming, video calls, and now, ‘Quick Updates’. Yes, a supermarket offers a large variety of products under the one roof; eggs, milk, bacon etc, however, when it comes to finding that perfect cut of steak, no supermarket can compete with the quality of produce, and personal connection that can be formed through shopping at your local Butcher Shop. This is where I feel Snapchat is winning, and will continue to win. Just look at the huge success in their release of Spectacles. They’ve taken a very niche product (think Google Glass) and taken it from the techie, early adopters niche, and introduced it to, as well as made it relevant for, the mainstream… that’s the power of the brand. Even in their headline-grabbing promotion of Spectacles, the one thing that remains constant, and where their undoubted strength lies, is in their quirky branding. Not too bad for a ‘ghost that vomits rainbows’, eh!? You can find me across social @cammysutra6, although I tend to frequent both Snapchat and Twitter more often than the others. Yes, the ‘6’ still drives me insane, and I’ve got a certain cammysutra in Amsterdam, who hasn’t sent a single tweet in 8 years, to thank for that. I would just briefly like to say thank you to you guys, thoroughly enjoyed chatting with you, and hopefully I’ve provided a little food for thought. One final piece of social advice I’d like to throw in there before I go, is to remember that Marketing is a mix of Art and Maths. Some people love their metrics and analytics. Some people love their creative. However, it requires consideration of both of these elements to succeed in social marketing, not just what suits your skill set or preference. Remember: who will amplify this, and why? #1 Snapchat can be fantastic at offering insights to what your brand story is, why you do what you do, and the culture that has been built behind the scenes of your brand, it’s about people – not the product. #2 If people are desperate to attach themselves to Snapchat, believing that the brand equity gained through their activity on the platform will produce the results they desire. What they fail to consider is that through poor execution, and production of half-assed content on Snapchat, the result can, in fact, be quite the opposite. #3 You need to consider the fact that consumers of your content can smell BS a mile off, with inconsistency often being considered and recognised as a lack of Authenticity. Thank you, Cammy for taking the time to share your knowledge and opinions on using Snapchat for non profits. To connect with Cammy on Snapchat, scan the snapcode at the top of this article. If you enjoyed this interview, please check out more in the Snapchat Influencer series.